Well this is the time of year that I think most of us have mixed feelings about. On one hand we can’t wait to have the kids all to ourselves and enjoy some proper family time together but then we’re also secretly panicking about what we are going to do to keep them happy for 6 weeks and how much is it going to cost? So I thought that it would be a good idea to put together a small list of fun free (or at least cheap) things to do in the summer holidays. You might be thinking that taking the kids to the cinema is definitely not a cheap activity and you would be right. However have you checked your local cinema’s website to see if they have an offer similar to this? Kids club: Our local cinema has a great deal called Kids Club, where they show one film a week once a day at a huge discount of £1.50 per person for 2D or £2.70 per person for 3D. It is usually held every weekend at 11:00am and then every day – with different time and film options – during the school holidays. So for our family of 4 it literally costs us £6.00 to treat the kids instead of £21.60 (which is the family discounted ticket) 🙂 now I’m not a skint flint but because this is such a great deal we never pay full price to take the kids to the cinema, we wait till the films they want see are on the kids club offer which actually doesn’t take as long as you might think. In our home town in Lancashire we have a few different activity centres but I’ll just mention a couple that will be a nationwide option. Leisure Centre: Local Leisure Centres are obviously well loved by all for the swimming pool which is a great day out for the kids and doesn’t have to cost the earth if you plan ahead and get a picnic ready and waiting for afterwards. They also have different summer holiday clubs such as the sports programme for children aged 5-16 for just £12 a day. This isn’t something that I would do often because £12 isn’t that cheap if you have more than one child wanting to go. But if your children are as sports mad as mine then this would be a real treat for them. Sure Start Centre: You might think that they only do things for babies and toddlers, but during the school holidays they have a range of activities outside of the centre for all ages too. I’ll admit that a 13 year old isn’t going to want to go on a bear picnic but sports days and den making clubs at the park should keep a variety of children happy. Which amazingly are free 🙂 happy days. I’ll also be able to take both my boys to one of the groups at the centre as well. Even though Isaac has just finished his first year at school the Explorers Club is for ages 0-5 and for myself and my 2 boys it will cost £2.50 for an hour and a half of painting, creative play and lots of energy burning. Now we all know where our local library is, but do we use it enough? I love the fact that my boys still get excited to go and pick on average around 10 books to bring home. We then like to pop into the bakery on the way home to get a few yummy treats to enjoy while we work through the small mountain of stories. The library also has story time and song time groups on once a week which are free and they provide drinks and snacks too. 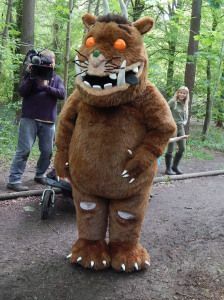 As I have mentioned in another post The Gruffalo* is well loved in our home so we are very excited that there has been some wonderful Gruffalo additions to family friendly trails across the UK from 11th April – 30th September 2014. They are self-led walks which are perfect for picnics and letting your children wear themselves out. All you have to pay for is the parking. Keeping the kids entertained for 6 weeks when you’re on a tight budget can seem daunting but I hope that you have found something in this post helpful. It is just a sample of what is out there that doesn’t break the bank so keep a look out and be creative. How Many Expensive Days Out Do Kids Really Need?